The Holley line of high output in-tank electric fuel pumps is available in flow ratings of 190 and 255 liters of fuel per hour. A 155 liter per hour Mustang pump is available along with 255 liter per hour rated pumps for "forced induction" applications. These particular pumps flow significantly more fuel at high pressure. For example, at 80 PSI the standard 255 lph pump will flow around 132 liters (35 gallons) per hour. At the same 80 PSI the equivalent forced induction pump will flow over 210 liters (50 gallons) per hour. Holley in-tank electric pumps utilize a proven geroter design. The outside dimensions, however, are compact enough to fit existing hanger assemblies, without modification. Coverage includes most popular Ford, General Motors, Chrysler and import applications. 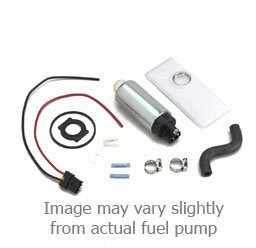 These are complete fuel pump kits and include all accessories and installation instructions. Also includes is an inlet filter that meets or exceeds original equipment specifications and provides improved filtration and durability.